This is for all you firepit lovers! Our family bundles up and spends many an evening at the fire pit talking and laughing and drinking coffee or hot chocolate or something a little stronger! We are fire pit people, for sure! I have such a fun way to get the fire roaring. PINECONE FIRE STARTERS! They are super simple to make and even if you are not crafty you can do this! Keep a little basket of them handy to help you light your fire pit and keep you warm on chilly nights. But don’t keep them for yourselves! Make extra to give as a great gift! 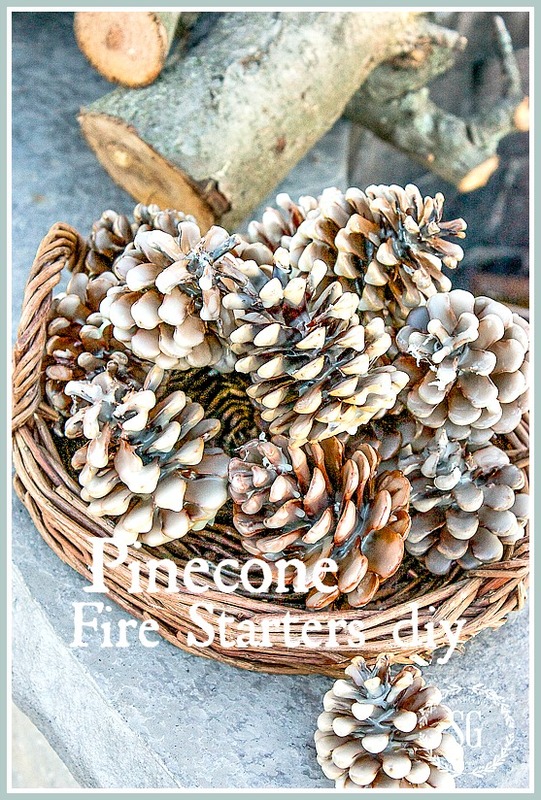 Let’s make Pinecone Fire Starters! Not only are they useful… they are also so pretty! 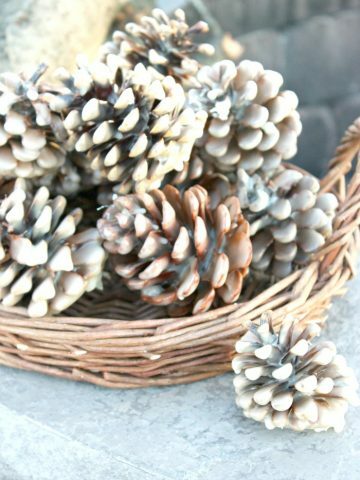 Attach an 8-inch piece of wire to each pinecone by looping the wire around the top of the pinecones and catching some of the arms in the loop. This will give you something to hold on to when you dip the pinecones into the wax. Create a bain marie, or a water bath, to melt the beeswax pellets. DO NOT put the beeswax pellets directly into the pot on a heat source or they might cause a fire. Add a few inches water to the pot and when it is just barely simmering at a very low heat add a 2 cup glass measuring cup filled with beeswax pellets inside the pot of simmering water. One pound of beeswax pellets is about 1 1/2 cups of melted beeswax. Let the pellets melt completely… this takes longer than you think! Watch them carefully. Once they are melted you can turn off the heat source. When the pellets have completely melted, dip a pinecone into the wax using the wire to guide them into the wax. 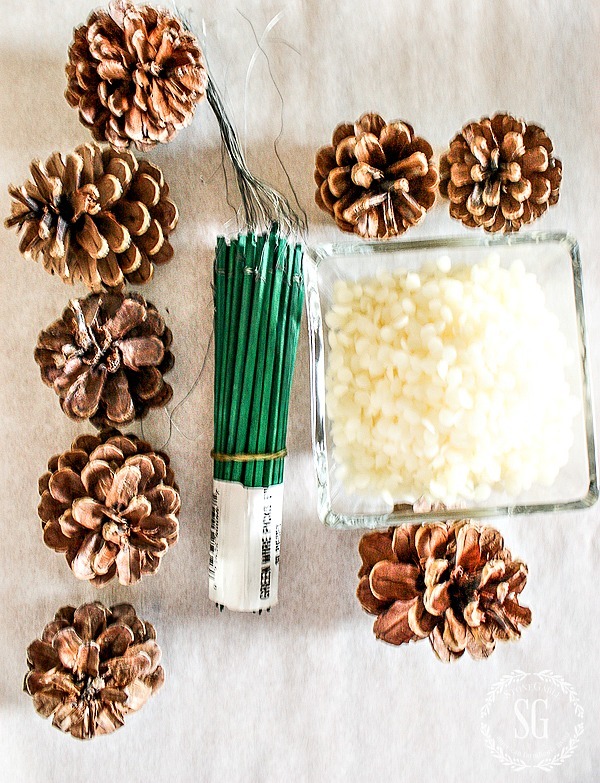 Pull the pinecone out of the wax and hold it above the measuring cup to let it drain. Move the waxy pinecone to the wire rack. Dip pinecones until the rack is full. The pinecones below have been dipped one time. Redip the pinecones two more times letting them harden in between dipping. 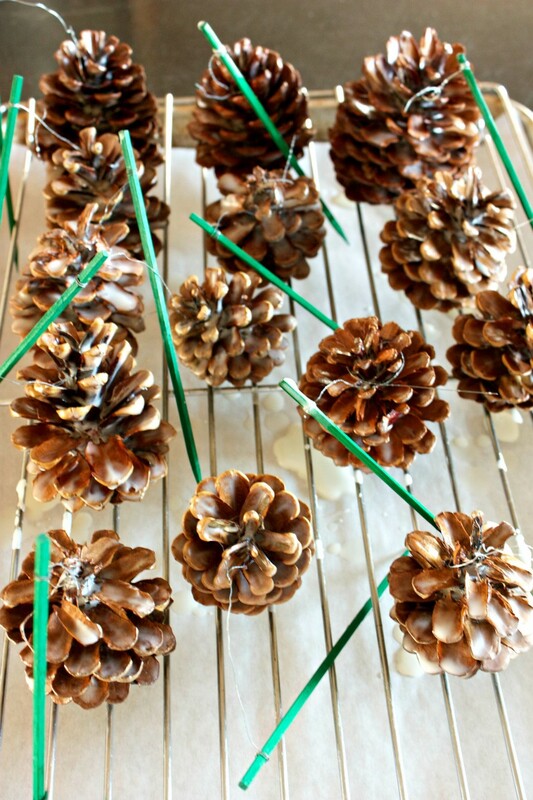 Set the pinecones on the wire rack to harden and remove the wires. That’s it. One pound of beeswax makes about 13 multisized pinecone fire starters. This work amazingly well to get a fire going. We use 3 pinecone fire starters for each fire! Did you know that I have a “Craft” Pinterest board with almost 400 pins and a “DIY” board with almost 600 pins? 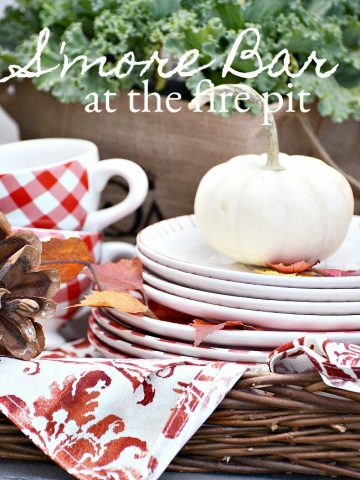 You might like to follow me on Pinterest and see what I’m finding to pin every day HERE. 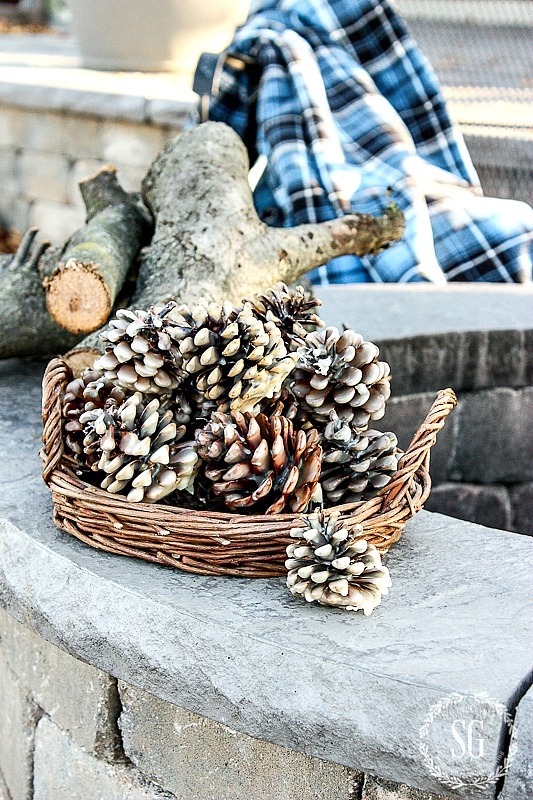 The pine cone fire starters looks like fun and they would be a great gift too! These pine cones are beautiful. I want to make them and put them in a bowl or on my mantle for the winter season. Thanks for such a wonderful idea. I really like that I can make them and use them up this winter to avoid packing them up after Christmas. Oh what a great idea, Michelle! We sure needed these this last weekend!! Making a big batch for sure Now!! Love this idea, especially doing them scented! Great idea! I used to make these years ago, and it’s time to make a new batch since the fireplace in our new home doesn’t have a gas starter. Such a clever idea and so appealing to look at as winter approaches – love it! Love these! You can’t beat something beautiful AND practical! A set of these would make a great hostess gift. Thanks Yvonne for the idea. Great Idea. We have a fire pit and this would be great. Can they be used in a home fireplace? Jan, I’m not sure. I wouldn’t just because they contain beeswax. Great gift idea, useful and pretty. I’m not very crafty, but I think I can do this! Will definitely make some for our fire pit! 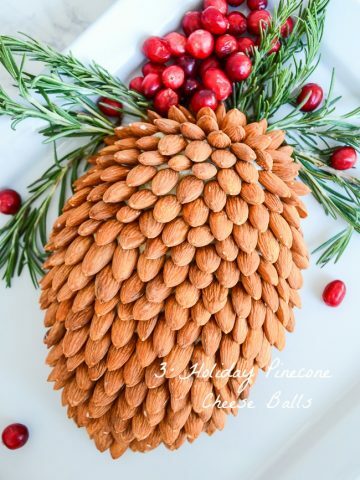 I have already many pine cones so I will try this new idea! Oh can’t wait to make these!!!! We have an endless supply of pinecones on the farm.What a neat idea to use all those cones, thanks Yvonne and have a great day. I want to make these! Do you know if there is a way to make them smell like cinnamon? Maybe adding an oil? Or cinnamon powder? Yes, and it’s so so easy! Add cinnamon oil to the melted beeswax. Okay, now this is a seriously cool idea. Thank you! lovely idea! 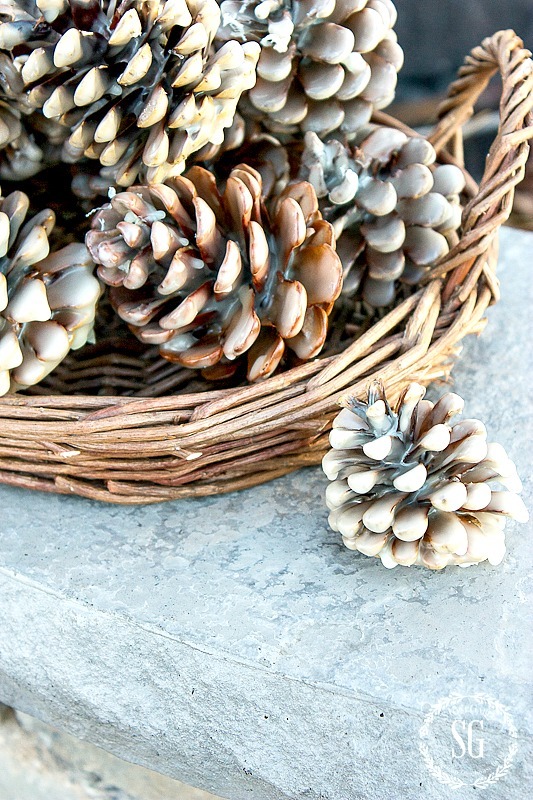 I do like to use pinecones in decorating- these make it fun and useful! I never knew it could be so easy to make these. Thank you!! Very cool! Wouldn’t a basket of these make a great hostess gift, too? What a fabulous idea, Yvonne! What a wonderful gift idea. I will be making these for both myself and friends. Thank you for sharing. I had forgotten about making fire starters. I have pinecones everywhere and this would be fun to have when the children are here. I used to dissolve boric acid in a hot water, soak the pinecones in the solution overnight, and dry them thoroughly to get colors in the fire. I have forgotten the proportions but know it’s online. I wouldn’t use this if you are going to cook on the fire. Good idea! I also wouldn’t have to wait for hubby to start the fire with these! Thanks! What an idea for Thanksgiving gifts, so they can be used before Christmas. I have used green and red waxed pinecones which made them festive. These are so pretty! I’m thinking I might add a few drops of my favorite essential oil to the wax. I used to dip pinecones in melted paraffin wax for display purposes only. Using the beeswax gives them such a pretty frosty, icey look. I love this idea. Off to Michaels I,m going to pick up the beeswax with my 50% off coupon. Perfect timing craft!! I do this all the time. No need for high end bee wax (save that to make “good” candles), just save and melt all your old candle stumps, left overs from candle jars where you can’t get the last bit lit, or tealights. You can even put the pine cone in a muffin tin and pour the wax over them. What ever collects at the bottom pops out attached to the waxy pine cone and burns well. Replying to my own post, HA HA. Check out Plow and Hearth. One dozen of wax pine cones for $19.95!!! They sell the “muffin tin” method. I have found that you really don’t even need the wick, but you could wrap the cone in cotton string if you want.Also a few drops of essential oil to make them smell pretty, a basket, a few cinnamon sticks, and a pretty bow. No need to even wrap! I like that idea. Not only are they useful they’re also very decorative. Love these for a gift idea! Adding glitter would be fun too! 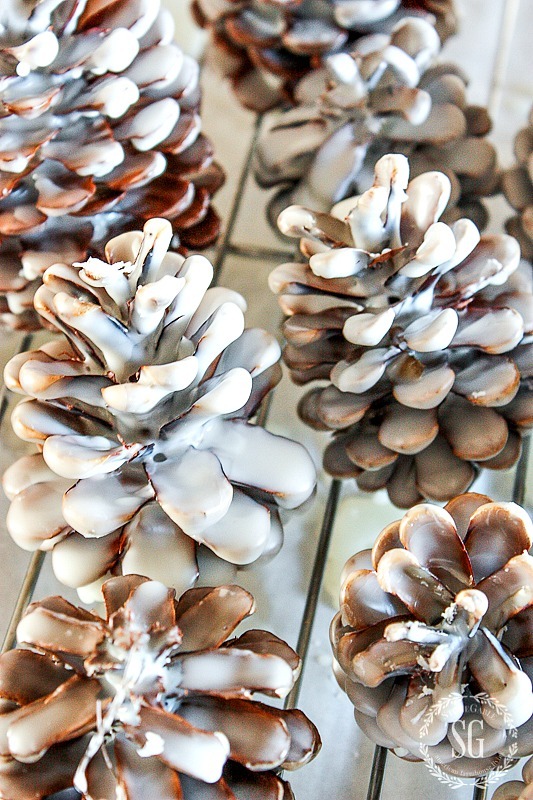 Been collecting pine cones and wasn’t sure what I wanted to do with them….now I know! What a great idea…I’m doing this for sure! Thank you! What a great idea. I love the other comment about adding glitter, and just using them for decoration. They look like great fun to make and I love fire pits, nothing better than sitting around the warm glow, especially with a glass of hot mulled wine! Cant wait to try them! They will be fun to have and to give! Wonder if you could use “leftover” candle wax, chop it up, remove the wick and melt it down? The beeswax makes them lovely, but a bit pricey. Plus I have lots of white candles that are really too low to burn. May try it. Thanks! Wow! Pretty and functional!! I will have to try these Yvonne! Thanks so much for this useful tip! i can just imagine all the wonderful memories you are making for your family. nothing like a school teacher to organize fun! ha! yay you!! I have made these before and the DO work well! Thanks for sharing. I was wondering about clean-up of wax—is it burned off to nothing? I love the idea but not sure about clean up? They are certainly pretty. Do you take the wires off after they dry to be reused? THnaks for sharing StoneGable posts! Good idea Yvonne we don’t very many pine cones in california. but i will look . What a great idea to pin. It would be a great gift for our daughter with the fire pit. Thanks for sharing this one! Love it Yvonne!…they look wonderful in the basket even if you do not use them as fire starters! What a great idea! I can even see giving these as gifts! I’m all for bundling up and sitting around a fire. love it! making these for gifts for thanksgiving gathering! Great gift idea, besides using them for yourself! Thanks as always! I have made these with colored wax too! So pretty for even just decoration!! They are pretty. Makes me think of snow on pine cones. Would make a sweet gift. What a great idea! This also gives me an idea…dipping them in wax melts to display in a bowl and smell good? Thanks for the inspiration! What is the wax doing to start the fire? Why not just pinecones? Could you use them in a fireplace INDOORS? Does the wax drip to the bottom of the pit to be cleaned later? They are grand, would like to make some, just trying to understand the WHYS. I have found that the wax is what really makes the fire get going, and the pine cone makes it burn longer. I use indoor and out. The fire burns so hot that the wax burns off. No mess. Wonderful gift idea. Thanks for sharing. I am making some to give to co-workers as Secret Santa gifts. We are fire pit people too! I would love to give these as a gift. I love these! What a great idea to make your own! This would be a great gift to take to friends as well. Love this idea. I have seen them in the stores but what a great idea as usual from you. They look so pretty too. I am going to make these for this weekend. Thank you. Beautiful, fun to make and fun to enjoy! Thanks for the idea. We are fire pit people as well! I’ll be making these soon but it will be tough to use them they are so pretty. So pretty… i received a fire pit for my birthday, but due to the hurricane we didn’t get it set up yet. Oh, a sprinkle of glitter looks great on these and are fun in the fireplace shooting off lots of color.